This post, written by Andrea Dipp, was originally published as a report entitled “I'm Going to Pump Up So I Can Charge More During the Cup”  [pt] and is part of investigative journalism agency Pública's special #CopaPública  [pt] coverage of the 2014 World Cup. It is the last in a series of three articles published on Global Voices Online. Eu sentia muito medo de como elas e a sociedade iriam reagir. Mas não tinha outro jeito, era quem eu era. Então contei e elas até que aceitaram bem. I felt really afraid about how my family and society would react. There was no way out of it, though. I was who I was, so I told them and you could almost say they took it well. Minha mãe ameaçou me botar para fora de casa, dizia que eu nunca iria arrumar emprego, não aceitou. My mother threatened to throw me out. She said I would never get a job. She couldn't accept it. Eu sempre gostei de fazer cursos, estudar, queria trabalhar com carteira assinada, nunca quis fazer programa. I always liked going to class and studying. I wanted someone to hire me. I never wanted to become a prostitute. “…e o patrão não aceitou os atestados médicos”. “…the manager wouldn't believe my doctor's notes”. Todas as portas se fecharam para mim. Não tive outra opção a não ser ir para a rua. Se eu pudesse, escolheria outra vida. Como não posso, me concentro e trabalho muito para poder juntar algum dinheiro para um dia abrir um negócio. Vou ficar velha e ninguém mais vai me querer. Every door closed on me. I had no other option if I wanted to stay off the streets. If I could have, I would have chosen another life, but since I can't, I work hard to make ends meet and one day open my own business. I'm going to end up old and no one will want me then. Eu tenho anúncios em sites e também quero ir para a rua na época da Copa. São Paulo estará cheia de gringos e mesmo brasileiros de outros estados, quero aproveitar. I've put adverts up on websites and I also plan to go out into the street when the Cup is on. São Paulo will be full of foreigners and even Brazilians from other regions. I want to make the most of it. Tem gente que paga o dobro e até o triplo do valor para transar sem camisinha, aí eu acabo fazendo. Estou com medo de fazer o exame [de HIV], mas sei que a saúde vem em primeiro lugar. You get people who pay double or even triple to do it without protection, and I end up doing it. I'm scared to take a [HIV] test, but I know that health comes first. 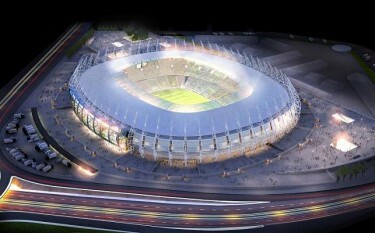 Castelão Arena in Fortaleza will be one of two World Cup 2014 venues. Wikimedia Foundation. Free use. Já falei com uma pessoa que leva travestis para lá. Ela cobra 10 mil reais para passar a gente. I've already spoken to someone who takes travestis over [to Europe]. She charges 10,000 reais [4,400 US dollars] to do it. Que nada, é a mesma coisa daqui, só que ganhando em euro. Not at all. It's the same game over there – the only difference is I'll be earning euros. Nossa, me senti uma celebridade lá, me senti como a presidente Dilma! Todo mundo vinha falar comigo, ver como eu mudei, até as pessoas que falavam mal de mim viram que eu conquistei. God, I felt like a celebrity there. I felt like Dilma [the President of Brazil]! Everyone would come over and chat with me, see how I'd changed. Even people who'd spoken bad of me before were able to see how successful I'd been. With the money she earns at the World Cup along with her earnings in Europe, Marcela hopes to return to Ceará and open her business – that much is certain. A beauty salon, or maybe a clothes store, because she loves fashion. Glancing at her watch, she bids me farewell. She has to get back to work.